This month we’re off to Northwest Italy for our inspiration, and this week’s cheese is Robiola Bosina – a mixed milk cheese from Piedmont. Made with both cow’s and sheep’s milk, it comes in mould-ripened squares that can turn pretty gooey as the cheese ripens. 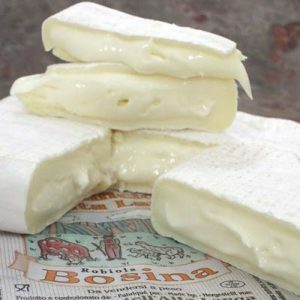 It’s pale in colour and creamy in texture, with a fresh, slightly sweet flavour. Unlike a lot of cheeses, I like it straight out of the fridge, a little chilled, but you might prefer it extra-runny once warmed to room temperature. Look out for a few more Italian goodies creeping into the shop in the coming weeks.